Remember when the world laughed at Susan Boyle’s dream? It was 2009. She stepped onto the audition stage of Britain’s Got Talent and everyone laughed at her. They mocked her appearance. They scorned her age. No one in that theater seemed to believe her dream was possible. The whole world seemed to be watching and waiting for Susan Boyle to be embarrassed, so they could laugh her off the stage. And God had the last laugh. See, God made Susan Boyle. He placed those gifts in her. He gave her the dream of being a professional singer. And He knew what was inside her all along. The world saw the outside, but God knew the inside. And when He knew it was time, God showed Susan Boyle to the whole world. You might even say He flaunted her to the whole world. He publicly displayed her. He HONORED her. He embarrassed her enemies. He turned all those mockers into her biggest fans. He gave her the desire of her heart. Whatever it is, it’s not too big for God. As a matter of fact, if that dream is holy and righteous, God gave you that dream. Holiness and righteousness can’t come from anyone other than Him. So He placed that dream inside you. It doesn’t say He will give you what others think you can have. It doesn’t say He will give you the things that fit the confines of your age, your ability, your financial condition, or what Mama and Daddy had. No, He says He will give you the desires of your heart. It’s true that your dream may take time. You may be hidden from public view for awhile. In His quiver He has hidden Me” (emphasis mine). Jesus, the Son of God, had to go through a period of time (about 30 years) when He was hidden in God. Nobody knew Him. His Own family didn’t recognize who He was. The Bible doesn’t record any miracles that He did during that time. If you were looking at Him from the outside, you might have thought there wasn’t anything special about this Man. God hid Jesus like an arrow in His quiver. But when the right time arrived, God got Him out, fitted Him to His bow, and shot Him into His destiny. You may be hidden right now. Nobody may know who you are. Maybe few people believe in you. Your circumstances, experience, finances, age, physical appearance, and resources may look all wrong for the job. But God will have the last laugh in your life too. Your dream is NOT too big for God. If you’ll delight yourself in the Lord, He’ll bring you into your dream. The innermost dream of your heart. The one you let die a long time ago. The one nobody knows about. The one you’re too nervous to even tell anyone about. That’s the dream God gave you, and that’s the dream He will bring you into. He promised, and it’s not possible for Him to lie. So what dream do you need to dust off and resurrect? What dream do you need to take back to the Lord in prayer? If you’ll delight yourself in God, He’ll bring you into your dream. When the time is right, He’ll get you out of His quiver and shoot you like an arrow into that dream HE gave you. What dream do you need to believe for once again? Thanks for this; it speaks directly to my situation, especially the part about “age.” I am making a retreat for 24 hours with a prayer partner because “the dream” appears to have stretched the reality to the breaking point. God’s teaching grows and grows, but the means of passing on that teaching is a trickle, not a flowing stream. I have travelled a long way on a vision of The King’s Estate (the place where we live) being preserved and its ministry prevailing, but it looks just now like everything is unravelling and I have no clear idea of the way forward. I am still that “hidden arrow”; although some powerful people have learned about my work, no one has stepped forward to endorse or support it. Your words give me strength and hope. Hi Laurna. Thanks for reading as always. I pray that your retreat would result in an amazing, comforting, encouraging encounter with Papa God. I pray that Holy Spirit would remind you that Papa God delights in you; that your picture is on His refrigerator and your name is carved on His tree. I call forth the finished works the Father created for you before the foundation of the world, and I command them to manifest in your life in Jesus’ Name! Thank You Papa for being such a huge and holy and good Papa to Laurna! Thank you, Jamie. That personally affirming prayer means a lot to me. Hi Jamie, I’m Jenny. 🙂 I found your website through (in)courage. Your compassion and heart of encouragement toward your brothers and sisters in Christ, and your passionate, reverent devotion to and love for Jesus is very evident and flows through your writing, and is what attracted me to your ministry. Many of your posts have been resonating with me lately. I read your last post and really wondered if Jesus was giving me a different message from the one I’ve been hearing from Him lately, which is that I am not supposed to come out of hiding right now, but to obediently wait on Him and learn from Him and to worship Him in the quietness. I offered up these questions to Jesus and trusted that He would guide me if He wanted me to change course. So this post is clarifying for me, in that regard. It describes what Jesus has been telling me He is doing in my life right now. To be honest, I’m not quite sure what His plan is for my life in the long run, but I assume it has something to do with my writing, as I used to have a dream to be a published novelist. I wasn’t raised in the Charismatic faith tradition, so the prophetic is something I have been learning about, especially in the last year or so. A lot of the prophesies were full of such urgency and intensity. Eventually, I had to sit right down and open my heart and ask Jesus was there anything more He wanted from me than what He had told me- to love my husband, to love my daughter, and to write about Him. My jaw like to dropped! 🙂 Because of abuses in my past, I am particularly vulnerable to the voice of accusation, but Jesus has come into my life in this beautiful, powerful and redemptive way, and I realized that telling my story of redemption in Jesus was not too small- it was far greater and more powerful than I’d been thinking- it is listed after the blood of the Lamb. It is in fact one of the weapons by which the accuser is thrown down. It like the darkness when the light enters the room- no matter how great the darkness, it simply must retreat before the light. It’s powerless before the light. The light throws it down. The dream of being a published writer naturally died away when Jesus came into my life and began to teach me and heal me from old wounds. I think eventually, He will resurrect that old dream, but in His new life and for His purpose. Thank you for providing so much good content here on your website, and for your tender heart. I have been encouraged, challenged and enriched by your ministry. Hi Jenny. Thank you so much for reading and commenting. I got your email also. I am so sorry for the delay. Your comment did not appear immediately on the post because the system is set to make me moderate all comments before they appear. Sometimes it takes awhile. I work full-time and can only usually get to them in the evenings and on the weekends, and this weekend I have been very sick plus out of town in the middle of nowhere without internet access on my computer, so it took longer than usual. I am so sorry and ask your forgiveness. But I love what you had to say. The word of your testimony is so powerful. And the testimony of Jesus, and who He is and what He has done for you, is the spirit of prophecy. It actually releases the power of what God has done for you into the person who hears or reads it, and makes it possible for them to have the same encounter with God themselves. It thrilled me to hear that God is calling you to write. It’s funny how some dreams die for a period of time, but at the right time, God resurrects them and clothes them with His purposes. Who knows? Maybe this dream is coming back to your heart for just such a time as this! I would really encourage you to go for it. Start taking little steps as the Lord leads you. One word at a time, one thought at a time, your outline will come together. One thing at a time. In five years, you’ll be 5 years older whether you are any closer to your dream or not. Why not start now with those tiny steps of faith, and watch for God to come up under you and fill you with His creativity, inspiration, and divine flow? Your Papa still loves to create. Ask Him to create through you and see what happens. I’m thrilled to meet you. If you would like to talk any more about anything, it would be a pleasure. Facebook is always a great way to reach me, or leave a comment here. May our PAPA fill you with His grace and joy today! I’m so sorry to hear that you haven’t been feeling well. I pray that Jesus holds you in His healing arms and restores you to health and vitality. I am so relieved to hear that there was nothing wrong with my comment. I come from a legalistic background, where everything had to be exactly right- especially when it concerned God, and those fears still come up when another explanation might be more probable. I wondered if maybe I was using that verse incorrectly or if my content wasn’t the right fit for the blog or something of that nature. There is nothing to forgive, not at all! In fact, this was a wonderful opportunity for me to practice something Jesus has been teaching me lately, which is to participate. I thought to myself, I can wonder and hide, or I could just ask! Asking for clarity felt like freedom and invitation to better fellowship, whereas wondering and hiding wouldn’t have been so productive. I never knew that before, but that is confirmation of something Jesus told me this year. I’ve been blogging about His work in my life for three years and nearly every time I post something, I struggled with fears that showing His love toward me would produce only sadness and comparison from others who might wish for or had never thought possible having a similar relationship with Him. This delayed my obedience to His call while I wrestled with fears that I wasn’t offering my brothers and sisters in Christ something that would be good for building them up. Eventually I would simply have to decide to have faith in Jesus and do what He was asking me to do, but it was a difficult process each time. This year as I was at a key point in my blogging, and consecrating my life and my blog to Jesus in a deeper way than ever before, Jesus asked me to simply drop those doubts entirely. 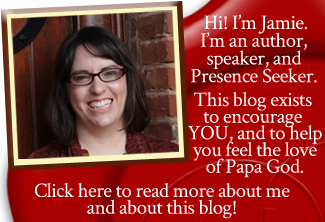 He said my blog helped others experience His love in greater and more intimate and free ways. Jesus told me to simply believe this and not to be hindered any further by doubt. Since then, I have stepped much more easily into obedience. This fits in perfectly with what you said! I will continue to write each step at a time and trust Jesus to bring into full expression His plan for my life when the time is right. Thank you so much for your encouragement and clarity. I pray you will feel better soon and that you will feel the love and comfort of Papa as you recover. My blog is called Scrivenery, and my last blog post was sharing a section of my journal as I processed recently being diagnosed with anxiety, which I had assumed was inflammation of the lining of the rib cage, or costochondritis. I read your latest blog post and can empathize. I suffered from anxiety as a child myself. How wonderful is the healing power of our Papa’s love as He restores our orphan hearts! This was so timely. I can’t thank you enough for this. I am single, 62 and have a dream. However, due to a lifelong autoimmune disease I have been on Soc Sec disability since the mid 90’s. I want to get OFF (strong emphasis only) of disability. Unfortunately, I can’t just do any kind of job due to my physical limitations. I am weary of being dependent on the government who tells us how much we can and can’t make. Besides, it keeps me financially strapped, unable to get ahead and pay off my debts. I have prayed for several years about my desire and dream, also asking that the Lord would through that dream fulfill 1Thess 4:11-12: “…live quietly, …mind your own affairs, and to WORK WITH YOUR HANDS… SO THAT you may walk properly before outsiders and BE DEPENDENT ON NO ONE.” I long to be productive, self-sufficient and not just exist working part-time, collecting SSDI. I want to have a purpose, use my gift and be independent from others (including the gov’t). My savings has dwindled after losing an 8 year p/t job and as time passes, I grow more discouraged. Please don’t misunderstand me — that is not meant to be a woe-is-me comment but a factual statement. Many, many people have commented on my gift and encouraged me to pursue it but due to a lack confidence, lack of contacts, and uncertainty of how to pursue it, I feel stuck. I’ve read books, and articles on how to go about it but it is an area that is very difficult to break into. I have prayed and prayed about it and tried to pursue it but it remains just a dream. Thank you for writing this. It was deeply encouraging. Hi Jan. Thanks so much for reading, and for your comment. The thing that is coming to mind right now is “what do you have in your hand?” Just like what Jesus said in the Bible, when all the disciples had was a few loaves and fishes. But God blessed it when Jesus gave thanks, and it multiplied in the hands OF THE DISCIPLES. So whatever skill or idea or tiny step of faith you have in your hand, I encourage you to start with that. Give thanks to God for it, and take one tiny step after another. Look for divine flow- what does God seem to be breathing on as you step out? He probably won’t show you the whole plan right at first, but just one step. As you take that one step, and cover it with prayer and God’s promises, He’ll show you another. His promises are true and they are all for YOU. It’s not possible for Him to let you down, no matter what your current circumstances look like. Love in Christ to you today! I mean seriously Jamie. You are all in my kool aid and you even know the flavor! I felt like my dream is taking so long. I blamed myself for being too busy with domestic engineering and nurturing 5 amazing people. This post just like the last 3 posts have been so refreshing, reviving, and revelational. Thanks for keep blogging from the throne room. Thanks so much, Venetia. To everything there is a time. Maybe your time has been for your little ones – but maybe also Papa might be bringing you into a new season where you will start to see Him do a new thing. He’s in the habit of doing new things suddenly, you know. 🙂 I hope so for your sake, and I totally want to hear about it if so! And you’re awesome and such a blessing to me. Thanks for reading and commenting. 🙂 Have a great day! Wow! Today, God placed a dream upon my heart that I know came from Him alone. It’s a dream I would never have by myself and can see myself talking myself out of it before proceeding. I trust moving forward He will guide my steps and make miracles happen, simply because He is God. Thanks for the courage and the boldness to speak His truth. It was a blessing finding you through Cornerstone Confessions and now I am a new follower. God bless! Hi Sarah Ann! Thanks so much for reading! Go for it with that dream! It’s amazing how, when we take those little steps of faith, Papa comes up under us and affirms our obedience and makes beautiful things happen, one step at a time! I’d love to hear more about it sometime. Nice to meet you too! May God continue to shine His face on you Jamie, as you let yourself inspired by the Holy Spirit of God to write and post messages as such. He gave me a dream that I reconnected with and which is making me quiver of joy and recognition. Praise God for the positive difference you are making, Jamie! Praise God! That’s wonderful, Henri! Thank you for letting me know! 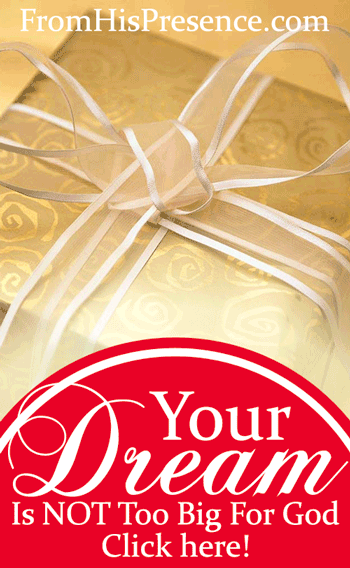 May your dream be blessed! Lately I’ve been drawn to a particular dream. I long to know if it is what God has in mind for me. I pray for Him to show me beyond a shadow of a doubt about whether I should pursue or wait. I pray his answer will be quick and clear. Thank you for caring so much about your brothers and sisters on earth. May God continue to use you in miraculous way.